Different kinds of lighting in a room can play an important role in accomplishing tasks, but not all lighting is created equal. There are differences between ambient lighting and task lighting, and both can be utilized to meet your needs. This article provides tips for setting up ambient lighting in your home, and lists additional resources about lighting solutions. What is the Difference Between Task Lighting and Ambient Lighting? Here is a hallway with LED lights. Task lighting is the localized lighting that brightens a specific area when doing close tasks such as reading, writing, and crafts and hobbies. An example of task lighting is an under-the-counter light in the kitchen, which makes it easier to see when chopping vegetables. Ambient lighting is general room lighting. It is often the light from the ceiling fixtures or the lamps on end tables. It provides the light that helps us move safely and comfortably around and through our homes. It can set the overall tone or feeling of a room. Think how energizing a bright sunroom might make you feel or the warmth from a softly lit room with a fireplace. Ambient light often supplements task lighting to create a workable environment. Consider increasing the overall amount of light in a room by adding an additional table or floor lamp. Avoid having a single bright light in an otherwise dark room. Keeping lights on during the day evens out indoor and outdoor lighting. This reduces shadows and glare from overly bright areas of a room. Keeping all rooms evenly lit reduces the need for your eyes to constantly adjust to changing light conditions as you move through your home. Use shades on the lamps. If the lampshades in a room appear to give a yellow color, consider using a bulb the has a cooler color. Yellowish bulbs are often “soft white” and bulbs that are white are called “daylight” bulbs. Look on the bulb’s box and many will tell if the bulb is soft white or daylight. Another way to determine the color of a bulb is to look for the bulb’s Kelvin value on the box. Soft white or warm bulbs have Kelvin values from 2900-3500 K. Daylight or cool bulbs have Kelvin values of 4000-5000 K. Higher Kelvin values are better utilized in a task lamp and not for ambient lighting. motion sensitive lights that activate when approached, making the light available only when needed. Be especially aware of lighting on stairways and have light at the top, middle and bottom of the stairs. Be sure that the path used to get from the bed to the bathroom is well lit. Some of us prefer being able to turn on lights before walking into a room. It can be difficult to find a lamp or its switch in a dark room. 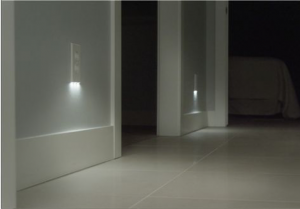 Wireless, LED lights offer a way to brighten a space before entering it. These wireless stick-on lights have remote switches that activate the light. The remote switch can be attached to a doorjamb with two-sided tape. The light itself is near the lamp that you typically turn on. Pressing the button on the remote switch turns on a light that can guide a path to the main lamp. If a switch is available, but difficult to find, consider a light switch that glows. Changing out a switch would require an electrician. Another option is to put a plate on the switch that gives sharp contrast to the surrounding wall. For example, a switch on a white wall might have a switch plate that is dark brown. Adding a touch cue to the switch plate is another option. A touch cue might be a 2-inch piece of the hook portion of stick-on hook and loop fasteners. The hook portion gives a “rough” feeling area. A few high tech options can help with turning on lights before entering a dark room. Smart speakers, like Amazon Echo and Google Home, work in tandem with smart plugs. You can turn on lights with a command to turn on a specific light. Ambient lights can be controlled with home security apps on a smart phone. Turning on the walkway, entry and front hall lights before getting into the house is a wonderful and safe way to enter the home when arriving after dark. Pantries and walk-in closets are often dark. This makes it difficult to find items and may create a hazard if there are objects on the floor. Several bright stick-on lights may prove useful. The Sharper Vision Store carries the Flip-It light that produces a very bright light with the flip of its switch. If a stick-on light helps, but not to identify a specific item, place an LED flashlight on a shelf next to the door. Use the flashlight to see labels. Lighting options have grown in the last few years. There are many more choices. There is no one answer for ambient lighting. Whether a fixture, lamp or stick-on light is used, it has to fit your lifestyle. The Council’s Sharper Vision Store has many products that can assist you with creating proper lighting in your home. We carry floor lamps, task lamps, and lamps with magnifier attachments. Visit our store to learn more. Store hours are Monday through Friday from 8 a.m. to 4:30 p.m., Thursdays from 8 a.m. to 7 p.m., call (608) 255-1166 or visit store.wcblind.org/store/lighting to view and order products online. If you would like a hands-on comparison of lighting options and what might work best for your home, consider making a vision services appointment at the Council or in your home. Call Amy Wurf at (608) 237-8107 to discuss the benefit of a low vision evaluation or an in-home assessment to help understand how to use task and ambient lighting to achieve your goals. Watch the Council’s Lighting the Way webinar from November 13, 2018 on YouTube. Go to www.lrc.rpi.edu/patternbook to see suggestions for lighting your home. Select the “room” option to see various lighting designs for different rooms in your home. Choose the “equipment” option to learn about lighting technology or equipment. Learning about lighting techniques, such as task and ambient lighting, can be found by choosing the “techniques” option. At Lighting the Way: A Key to Independence, download and read the booklet on Lighting for Older Adults. Discover practical information in the Lighting Solutions Guide. This booklet was written with low vision in mind and was a project in the UK between the Royal National Institute of Blind People and the Thomas Pocklington Trust.